Newman Sound Men’s Choir (St. John’s, NL). 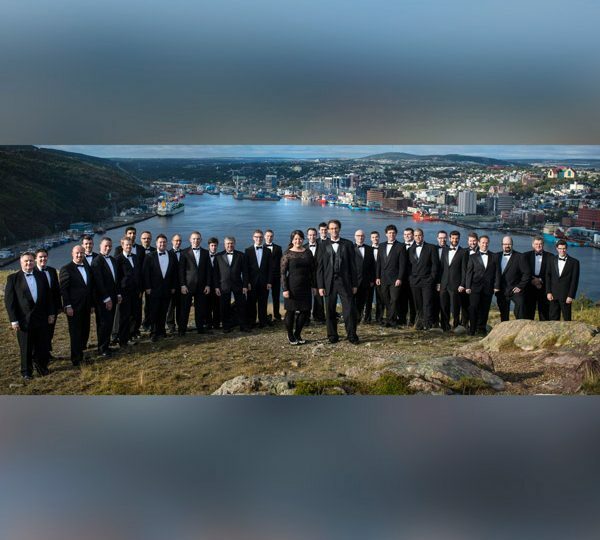 Pride, versatility and musical excellence best describe Newman Sound Men’s Choir of St. John’s, Newfoundland. Named after a beautiful and rugged region in Terra Nova National Park, Newfoundland and Labrador, Newman Sound was formed in 2005 by David Chafe, Kellie Walsh and Dr. Douglas Dunsmore. This is a true community choir of more than thirty experienced singers representing the professions of music, teaching, engineering, law, civil service, marketing, information technology, dentistry and medicine. Newman Sound has realized an evergrowing loyal audience, a high local, national and international reputation and a very bright future having established an exciting and eclectic repertoire across the genres of classical, pop and folk including some outstanding arrangements and original compositions by several of the singers within the choir. Newman Sound received a 2012 ECMA nomination and won MusicNL’s 2011 Classical Album of the Year award for their debut CD, “The Green and Salty Days,” a collection of traditional music from Newfoundland and Labrador, including specially-commissioned works by Stephen Hatfield and Kathleen Allan. Newman Sound has performed many times each year and has been broadcast provincially and nationally on CBC radio and locally on Rogers Television in St. John’s. In the 2006 National CBC Choral Competition, the choir earned the Galaxie Rising Star award for Most Promising New Choir in Canada and lived up to that promise by making it to the finals of the 2008 CBC Choral Competition. Now know as Choral Canada’s National Competition for Canadian Amateur Choirs, in 2015 and 2017, Newman Sound placed 2nd in the Equal-Voice Men’s Choir category. In 2012, Newman Sound was named Champion Male Chamber Choir at the 7th World Choir Games in Cincinnati, USA. The choir is also very active in the community with its support of charity events and its own annual and very popular Love Songs for Seniors for which the group performs free concerts at various seniors’ homes throughout St. John’s. In 2011, Newman Sound welcomed Jennifer Hart as Associate Conductor. She was immediately warmly welcomed by the singers and is now in her fifth season as Artistic Director and Conductor. A graduate of the Memorial University School of Music, Jennifer Hart received Bachelor degrees in Music, and Music Education, in 2007 under the direction of Canadian pianist Timothy Steeves. A proud native of Newfoundland and Labrador, Jennifer is also a promising choral conductor, having graduated from Memorial University in 2013 with a Master’s degree in choral conducting under the baton of Dr. Douglas Dunsmore. She holds positions, currently, as Associate Conductor and Associate Accompanist with Shallaway Youth Choir and, following an appointment under the mentorship of Kellie Walsh in 2013, Artistic Director and Conductor of the award-winning Newman Sound Men’s Choir. Most recently, Jennifer is beyond delighted to join Lady Cove Women’s Choir as Associate Conductor. Jennifer proudly serves on the Board of Directors as Program Chair for the newly formed Provincial Choral Organization for Newfoundland and Labrador, Choral NL. Jennifer Hart is an active, fresh, and creative part of the Provincial choral community in Newfoundland and Labrador, and a rising leader on the National choral stage; she often participates in conducting and vocal clinics with schools and festivals in Newfoundland & Labrador and the Atlantic Provinces.